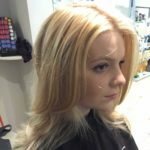 Watch this video and see how our very talented Senior Stylist, Bea Ford, was able to transform her clients hair in our Exeter Hair Salon today. Bea’s client came to see us with dry, damaged and badly coloured hair. Luckily Bea was able to fix this for her by using Olaplex to improve the strength and condition. Bea also gave her client a beautiful Balayage hair colour and finished it off with a fantastic Cut and Blow Dry.